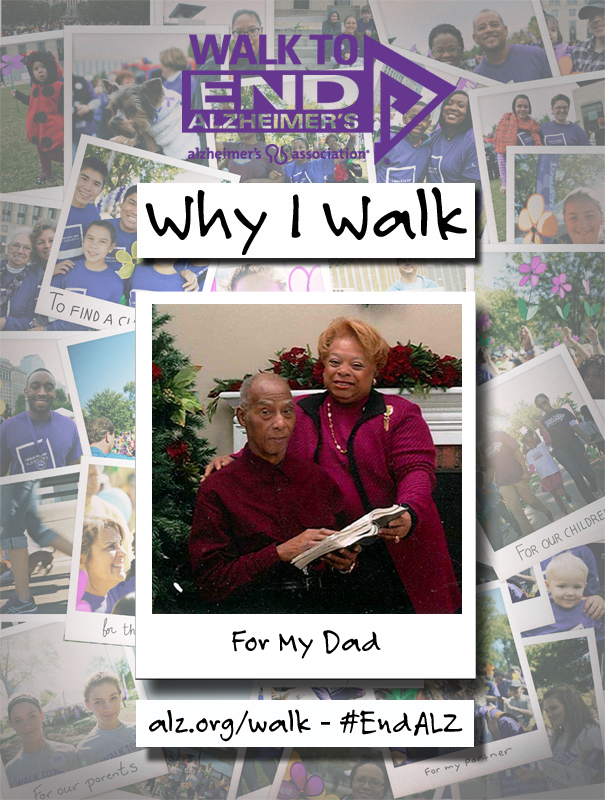 My name is Paige Lanier Chargois and I Walk to End Alzheimer’s for my father, Earlie Hayes Lanier, a man I have revered for many years who succumbed to Alzheimer’s a couple of years ago. This year I will Walk for him! Every child needs a parent to hold his or her hand to guide, secure, or protect them! Throughout much of my childhood, I would walk with Dad to the big supermarket nine blocks away. Alone or allowing me to tag along, he always walked to the store, bought the groceries then caught the bus back home. When I would hear him announce that’s where he was heading, I’d holler out, “Dad, can I go?” Of course he would say yes, grab my hand and we would take off. There’s a special memory about Dad within each of those steps – some of the best “daddy-daughter” conversations ever! Most special would be the moment as we set out walking when he would grab my hand in his. The strength in his hands was amazing. Compared to my tiny hand as a little girl, his hands were so large. The confidence that hand allowed me – that nothing could “touch” me as long as my Dad was holding my hand! All was right in my world! I remember the questions he would ask about school, about my playmates, about what I wanted to become. My responses are not all that important now, but I still relish the sense of strength and security I felt as long as Dad held my hand. I had no worry because I was walking with my Dad! Fast-forward about 60 years as I began providing care for Dad who had been diagnosed with Alzheimer’s. He still loved to walk throughout the community, but would occasionally lose his way although we had lived in that house more than 20 years. That helped me decide to relocate. I experienced a “nuclear melt-down” of memories covering hundreds of days he had held my hand when we walked together – including to the grocery store! The strength he had provided me over those years – just by holding my hand – became a power-surge of mega proportions! I slipped my hand around his hoping for and trusting in a similar surge of strength and confidence in Dad that he would then be able to walk a little better. And he did. This session aims to provide family members and friends with information about Alzheimer’s and other types of dementia, as well as information about local resources and services. Please call 804-695-9382 for more information. Please call Lori Myers, 540-370-0835, for more information. Call the Alzheimer’s Association, 804-695-9382, for more information.